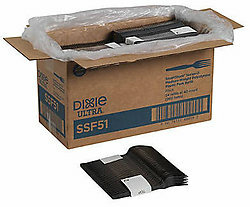 Dixie Smart Stock Utensils - Case. Clean, simple, sanitary. Each sleeve, conveniently slides into the appropriate Dixie Smart Stock Dispenser. Works exclusively with the Dixie Smart Stock Dispenses and System.